With the spotlight shining on climate action following last week’s Global Climate Action Summit in San Francisco, supporters are looking at ways to make renewable and low-carbon energy more accessible and affordable. A survey released at the summit by C2ES and The U.S. Conference of Mayors, revealed that the sampled cities most often used power purchase agreements (PPAs) as the tool to buy their renewable electricity. PPAs are a critical tool for increasing renewable energy projects in the market because they guarantee a long-term customer, making way for more project developers to access the necessary financing to build a project. That means PPAs can lead to new – or expanded -renewable energy projects that might not have been otherwise possible. A new C2ES brief looks at how cities across the country are using PPAs to realize their sustainability goals as they commit to reducing greenhouse gas emissions and start to use more renewable and zero emission energy. In a PPA, a customer signs a contract with an electricity-generating project to buy a certain amount of energy over a time period. One of the main benefits is that the customer can agree to pay a fixed price for electricity during the contract, allowing them to avoid fluctuating energy prices so they can plan for the long term. Cities can use two main types of PPAs: physical and virtual (also sometimes called financial or synthetic). A physical PPA is used when a city wants to buy electricity from a specific project, perhaps located nearby, but usually in the same electric grid as the city. There is a “physical” delivery of power from the project to the city, although since it is nearly impossible to track electrons travelling through the grid, the contract will state the location where the electricity legally exchanges hands. The city of Pendleton, Ore., used a physical PPA to put solar panels on its water and wastewater treatment plants. Through the deal, project developer Honeywell installed the solar panels, and the city agreed to buy the generated solar energy for 20 years. After the contract is over, the city can choose to either remove the panels or buy them. A virtual PPA gets its name because no electricity is physically delivered to the city. Instead, an electricity project directly sells its energy to the grid (one different from the city), and the owner of the project receives whatever the local market price of that energy sells for. In this situation, the city agrees to a “strike price” in the PPA, which determines whether the city receives money from the seller or owes money to them. A virtual PPA is an alternative for cities in states that do not allow customers to choose their electricity provider. It can also be an option for cities that have already exhausted other ways to get clean energy (either through installing local projects or other physical PPAs) or lack access to competitive clean sources of energy. Even though the city is not receiving local benefits, virtual PPAs can play an important role in supporting renewable electricity projects elsewhere. If that project is displacing electricity from a more carbon-intensive local grid, it can result in lowered greenhouse gas emissions. In a virtual PPA, if the market price of energy is greater than the strike price, the seller will pay the city the difference between the market and strike price. However, if the market price goes below the strike price, the city will owe the seller that difference. The below graphic, based on a chart from the U.S. Environmental Protection Agency, illustrates when the city would make money (purple areas) versus when the city would owe money (beige areas). 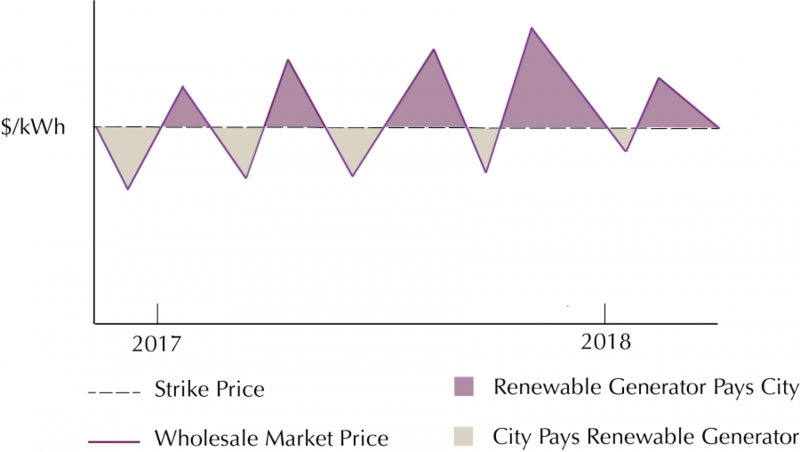 The strike price is fixed over the agreement’s life, but it differs from a physical PPA since the actual amount of money the city receives from or pays to the seller is determined by the difference between the strike price and the local market price for electricity. Note that the city still purchases electricity from its local provider, even though the city is buying and selling renewable electricity in the market where the vPPA is located. Although many private companies have been using virtual PPAs as of 2018, cities in the U.S. are starting to seriously consider them as part of their long term strategy. We may see a new example of cities using a virtual PPA in an initiative led by the City of Boston. The City of Boston has issued a Request for Information (RFI), on behalf of 20 cities across the nation. The RFI is a formal process for getting feedback from potential suppliers. The cities will use the information to consider formally soliciting renewable energy project bids from suppliers. The next step would be to negotiate and sign a virtual PPA. By joining innovative agreements like this, cities can play a pivotal role in creating new renewable energy projects as they seek PPAs to reduce their greenhouse gas footprints. Using physical and virtual PPAs help grow the renewable energy market demand and allow cities to more readily accomplish their sustainability goals.